Iranian rock refers to rock music produced by Iranian artists. Farhad (1944–2002) was one of the pioneers of rock music in Iran, emerged by the 1960s. Iranian rock music roots in American and European rock music, with influences from traditional forms of Iranian music and remarkable events such as the Shiraz Arts Festival. It was developed in the 1960s and 1970s, with the emergence of artists such as Farhad, Kourosh Yaghmaei, Black Cats, and Scorpio (not to be confused with the German Scorpions). Soon it became popular among the young generation, especially at the nightclubs of Tehran. Following the 1979 Revolution, the music industry experienced some period of encounter with prohibition in Iran. During the late 1990s, president Khatami advocated a more open cultural atmosphere in his domestic policies. As a result, a number of new singers emerged from within the country. Since the new administration took office, the Ministry of Ershad adopted a different policy, mainly to make it easier to monitor the industry. The newly adopted policy included loosening restrictions for a small number of artists, while tightening it for the rest. However, the number of album releases increased. In post-revolutionary Iran, live concerts are heavily restricted by the government. Rock bands might obtain permission to perform on live stage, provided their music is approved by the Ministry of Ershad. Most of the rock bands who cannot obtain permission rely on the Internet and underground scenes. 127 were the first Iranian underground rock band to tour the United States and play at the festival of South By Southwest. In 2008, power metal band Angband signed with German record label Pure Steel Records as the first Iranian metal band to release internationally through a European label. They had collaborations with the well-known producer Achim Köhler. The following samples a list of homegrown Iranian rock bands and individual artists, mostly active in Iran. Some are officially sanctioned, others continue to operate unofficially and independently due to the restrictions imposed by the Ministry of Ershad. Farhad Mehrad (since the 1960s; born in 1944, died in 2002) was a pioneer of Iranian rock music. 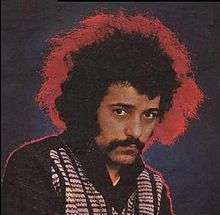 Kourosh Yaghmaei (since the 1960s; born in 1946), a pioneer of Iranian rock music. Kavus Torabi (since 1988; born in 1971), a multi-instrumentalist progressive rock artist from Tehran. Mohsen Namjoo (since 1993; born in 1976) mixes elements from Iranian traditional music with rock music. Shahin Najafi (since 1998; born in 1980), a Germany-based rap rock/rap metal artist from Anzali. O-Hum (since 1998), a folk rock band from Tehran. Reza Yazdani (since 1998; born in 1973), a pop rock artist from Tehran. Arashk (2001–2008) were a progressive rock/metal band based in Tehran. 127 (since 2002), a rock band from Tehran. Arsames (since 2002), a death metal band from Mashhad. Zedbazi (2002–2014) were a rap rock band from Tehran. Sirvan Khosravi (since 2002; born in 1982), a pop rock artist from Tehran. Barad (2003–2005) were a folk rock band based in Tehran. Buddahead (since 2003), a New York-based rock band from Tehran. Kiosk (since 2003), a country/blues/alternative rock band from Tehran. Laleh (since 2003; born in 1982), a Sweden-based indie rock singer from Anzali. Angband (since 2004), a power metal band from Tehran. Hypernova (since 2006), a New York-based rock band from Tehran. The Yellow Dogs (since 2006), a Brooklyn-based indie rock band from Tehran. ↑ "Farhad Mehrad's Official Website". farhadmehrad.org. Retrieved 2016-01-06. ↑ "Starting with Shabpareh – Iranican". iranican.com. Retrieved 2016-01-06. ↑ "'اسکورپیو' در آپارات". BBC Persian. 1 2 "Rock Rolls Once More in Iran As Hard-Liners Back Pop Revival". The Wall Street Journal. 2 June 2000. Retrieved 9 April 2010. ↑ "Roll Over, Khomeini! Iran Cultivates A Local Rock Scene, Within Limits". The Washington Post. 23 August 2001. Retrieved 9 April 2010. ↑ The Guardian (4 June 2014). "Iran's rock stars and their underground scene". Jai Brodie for the Tehran Bureau. ↑ Blabbermouth. "Iranian Metal Band ANGBAND Signs With Germany's PURE STEEL RECORDS". Archived from the original on 12 June 2008. Retrieved June 8, 2008. ↑ Blabbermouth. "ANGBAND: New Album Release Date, Track Listing Revealed". Retrieved Sep 16, 2010. ↑ "ANGBAND - Three New Songs Streaming". BW&BK. Retrieved September 10, 2012. BBC: "Fresh Iranian bands ready to rock"
Christian Science Monitor: "You say you want a revolution? Iran bands rock on." The Boston Phoenix: "IRAN SO FAR AWAY: Tehran rockers 127 make it to America at last"